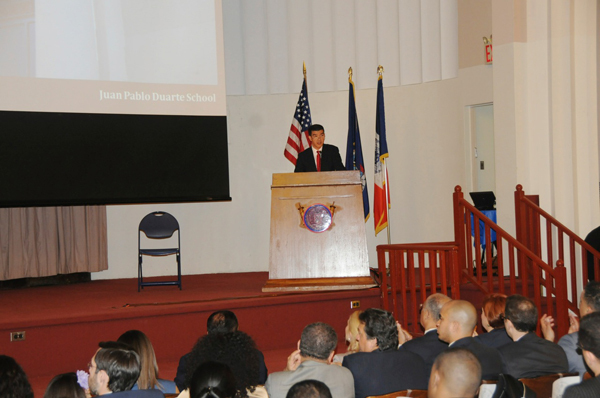 What follows is the full 2013 State of Northern Manhattan Address by Councilman Ydanis Rodriguez. Good Afternoon, how are we doing today? A big thank you to our Borough President Scott Stringer Rt that great introduction! Before we begin, I would like to ask everyone to please stand for a moment of silence for the victims of the tragedies that took place in Texas and Boston this past week. Thank you all for being here today! Let’s give our artists another round of applause. Our community is blessed to have such great talent. I would like to begin by thanking President Richard Joel, of Yeshiva University for allowing us to use this beautiful space. I also want to thank all my partners in government, the elected officials, and my staff and the staff of the offices of Senator Espaillat and Assemblywoman Rosa, who work hard every day to make our community better and to our volunteers and interns that have dedicated their time to support our work. Most especially, I would like to thank my family: my parents, Lidia and Ydanis, and my wonderful life partner Cristina and our daughters Yarisa and Ysla, who not only put up with me but make me a better man and council member every day. Thank you all! In 1613, Juan Rodriguez became the first non-indigenous immigrant to settle here in, NYC. Juan Rodriguez’s journey was the first of millions of people looking to create a better life for themselves and their families. In 2013, we can all say that we are related to someone like Juan. Personally I am still trying to figure out if Juan is my long lost uncle. Juan Rodriguez journey shows how similar we are and how we have all taken our own paths to end up in Northern Manhattan, a community built by immigrants of many ethnicities. Today we are here to discuss The State of Northern Manhattan, and I can tell you, it looks very promising. 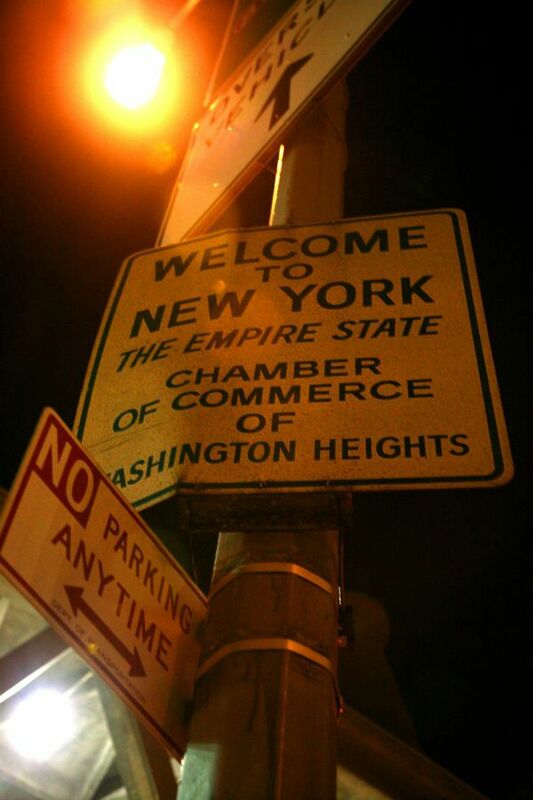 You can see this in the faces of our residents, in our local businesses and even on National TV, with the cast of MTV’s Washington Heights showing pride in their community across the country. They are here today and let’s applaud them for having kept their show positive. In our neighborhoods, we are witnessing new investments, new infrastructures, projects and businesses, strengthening the bonds that give meaning to the word “community”. The work of our community-based organizations is visible providing quality services and creating hundreds of jobs that will make a difference in our communities for decades to come. Community Based Organizations, elected officials, small business owners and neighborhood residents, have all contributed to making Northern Manhattan one of the best places to live in New York City. Regardless of the nature of the future and present challenges, we know that when we work together, we can look forward to and be proud of what the outcome will be—because our culturally diverse community is united and strong. Today, I will be sharing our vision for the future of Northern Manhattan, one that we can all be a part of. But I want to be clear; this is the vision of our team, Senator Adriano Espaillat and Assembly Member Gabriela Rosa. And of course, this team will always be open and flexible to work with the complete universe of other elected officials representing Northern Manhattan. And our right as residents to have a voice in matters of our community and beyond. In 2007, when Mayor Bloomberg released his report, Plan NYC, to visualize what our city would look like in the year 2030, our community’s greatest needs were left out. With the help of Senator Espaillat, Assembly Member Rosa, other elected officials, academics, the business sector and community leaders like George Fernandez, chair of Community Board 12, we have started the process of putting together ideas for our own, Northern Manhattan, 2030 plan! Allow me to go over some elements that will appear in the blueprint. To start, education in District 6 must improve. Not all of our students are receiving the quality education that we expect as parents. To close this gap, we must build a pre-k to college pipeline and this begins, with early childhood education. Rely less on government services later in life. A substantial investment in early childhood education will cut our city’s costs in the future. Yet, our city continues to try to cut these programs instead. Last year, my colleagues and I, with the help of Speaker Quinn, were able to save a daycare center that has served our community for 40 years, the Washington Heights Childcare Center. But clearly, we need more! This is why I support the Committee for Hispanic Children and Families in their work training staff at childcare centers to provide the best early childhood education possible. We need every child in our community to have a seat in a full day early childhood education program! Next, we must ensure that our elementary schools are given the support they need. We faced this problem at Juan Pablo Duarte, a school that has struggled in recent years, and where the Department of Education initiated steps towards closure. However, through the leadership of Northern Manhattan’s elected officials and parent activism, PS 132 was saved. A new dual-language school will be sharing its space, one designed to assist students of all ethnicities in learning a new language. With the opening of this school, Castle Bridge and Kipp NYC, and our support of all schools in our district, new options for parents and students further our goal of seeing every student in this community provided with a quality education. To overcome budget cuts in arts and music programs, I allocated $200,000 in funding to local cultural institutions over the past two years, to put them where they can help most, in the classrooms. Now, the Center for Arts Education at P.S. 5, and Midori and Friends at P.S. 4 are ensuring children still receive creative arts education; and at the Washington Heights Academy in P.S. 366, Children’s Arts and Science Workshops is teaching our kids about playwriting in after school programs, building the confidence, creativity and character that will resonate later in life. To help our children get into specialized high schools, I along with Columbia University have been a supporter of the Science Schools Initiative Program. In their 2012 class, over 65% of their Northern Manhattan students were admitted to a specialized high school; and for those that did not, they are now attending some of our city’s top high schools. Their class of 2013 is here with us today, let’s recognize them. This is a great program, that is why I’m doubling my funding to them this year so that they can keep expanding their valuable services. We want those top schools to be here in Northern Manhattan and that is why I am working hard with the principals of all our high schools to ensure they have the resources necessary to achieve this goal. This year I have allocated a total of 5.1 million dollars in capital funding to all schools that made a request, to ensure that they can be successful as they strive for student achievement. While, I have a special place in my heart for Gregorio Luperon, where I taught with its principal Juan Villar and other colleagues before being elected, I have dedicated time over the past year to the George Washington Campus. We are privileged to have one of the most beautiful school buildings in New York City; but in recent years, this campus has faced a number of hardships. Now, through the leadership of great principals, there has been a slow but consistent transformation. Mr. Sloman is using his creativity to encourage achievement through educational incentives like trips to Pennsylvania and Broadway shows. Mr. Politis floor brings stimulating programming to students related to Law and Public Service. We have been in discussions with the DOE to build on these programs. When schools—such as Health Careers and Sciences led by Mr. Trejo or Media and Communications by Ms. Michelen—focus on a particular specialty, they should find trusted partnerships with Columbia Presbyterian, or with television and music studios, to fully immerse their students in interesting curriculum. This is the future not only of George Washington but of all high schools in Northern Manhattan. We must create an environment where students are engaged in what they study so that they arrive at school every morning excited to learn. To continue my commitment to George Washington and the surrounding community, I am still working hard to renovate the indoor swimming pool! When it comes to higher education, we have a serious problem in our city. Our students have not been prepared for college. Currently, only 26% of students starting high school will be prepared for their freshman year in college. This number falls to 13% for Black and Latino students. Right now only 1 out of every 4 students in community college will earn their degree within 6 years. We cannot allow it to happen! I have been working with a number of partners like City Comptroller John Liu, to address where the greatest roadblocks lie and find ways to push through them. When students face struggles early in their college careers, they are more likely to give up and choose another route. and have aimed to keep CUNY institutes such as: the Dominican Studies, the Puerto Rican Studies, and the Black Male Initiative fully funded. This year, I will also work with CUNY, Columbia, Efe America, Bank Street College, Sloan-Kettering Hospital, Pace University, the business sector and one of my former students, Noquel Matos, now in Harvard’s Kennedy School of Government, to hold the first of many summits on college readiness; to discuss strategies, policy and programming designed to better prepare our students for college. This will be a vehicle to share the best practices around the city, putting our community and New York on the map as the college readiness capitol of the country. We also worked to bring CUNY in the Heights to a new building at 5030 Broadway in Inwood. This building now provides a state of the art facility for Hostos and Borough of Manhattan Community College students looking to take credits to get ahead in their degree programs, and many services available to the Northern Manhattan community, including a robotics program for kids starting in September. A big thank you to Aldrin Bonilla for your great work! I am proud to announce, that CUNY has agreed to continue expanding its CUNY in the Heights campus providing hundreds more students the opportunity to learn, explore and prepare themselves for a professional career. We cannot stop there. In 2010 almost 65,000 people between the ages 18 through 35 lived in Northern Manhattan. Close to 50% of that group, have a high school diploma but are not attending college. We need to enroll them in an institution of higher learning. We must do this so that we can add this group to the new middle class of Northern Manhattan. This number and other factors justify the need to build a new CUNY campus, right here in our community! I envision a campus that focuses on Science, Technology, Engineering and Math—the STEM fields—as well as a musical engineering program, to prepare our young people for the jobs of the future. Along with education, my other top priority is affordable housing. As we all know, too many of our residents and businesses are being forced out of the neighborhood with rising rents. I am still struck by the census numbers showing that over 18,000 of our former residents have moved away. If we want to retain our dynamic community, we must find solutions to the affordable housing crisis. I have worked with a coalition of a number of local community organizations to identify several locations around the district where affordable housing can be built. This Wednesday, April 24th, we will hold a major rally to call for true affordable housing in Northern Manhattan! Part of the struggle for affordable housing also lies in fighting negligent slum lords, something I have worked on with Public Advocate Bill DeBlasio in our community. We stood together to denounce the 200 worst slumlords in New York City, many of whom own buildings here. More recently, I stood with tenants from 183rd street—led by Miriam Ribera—whose landlord had cut off their utilities, literally leaving them in the dark and cold during the depths of winter. Miriam and the tenants could have given up and moved away, but instead they chose to organize and stand up for their rights! With the help of my office, other elected officials, the SRO Law Project and HPD Commissioner of Code Enforcement, Vito Mustachiuolo, the services were restored to all 3 buildings. The tenants have taken their notorious slumlord Hugo Eduardo Juarez to court and I will continue to stand with them this Thursday as they seek justice. To truly solve this affordable housing crisis, it is time we let our next Mayor, one of whom is sitting with us today know that we expect at least 10,000 new units of REAL affordable housing in our community. This can happen with a committed investment here. Through the rezoning of Sherman Creek and the transformation of the 207th Street rail yards into affordable housing; retail and community space; and an early childhood education center, we can secure Northern Manhattan’s future! A big part of keeping tenants in their homes with rising rents is making sure our community has a wide pool of quality jobs. Recently, when walking through the district on St. Nicholas Avenue, I passed a number of vacant storefronts between 183rd and 193rd streets. But with the new expansion of the Washington Heights Business Improvement District—through the work of Angelina Ramirez and my partners in government—we expect to see businesses opening with the full support of the BID and the community behind them. Just last month, with our support, the Washington Heights BID launched a new marketing campaign to increase its presence as a hub in Northern Manhattan. The Explora Initiative will attract shoppers and restaurant goers from across the city to 181st Street and the surrounding area, boosting our economy and showing off all that our beautiful community has to offer. Now, I am working with the department of Small Business Services to create two new Business Improvement Districts in Inwood and Washington Heights. On Dyckman Street with the help of Ariel Ferreira; and on Broadway between 159th and 179th streets with Community League of the Heights. This means more support for our local businesses, cleaner streets, summer festivals, promotional events and best of all, more jobs. I thank all of the business owners who have dedicated themselves to this community, our great taxi base owners and people like Dr. Eduardo Pignanelli of the Amsterdam Medical Center. This past March, Dr. Pignanelli donated 200 copies of Junot Diaz’s books and invited the Pulitzer Prize winner to sign and give away the books himself. It is this dedication from our small business owners that makes me proud to live in Northern Manhattan. And to ensure our neighborhood does not lose businesses that have roots in our community, I will be submitting a new bill to the City Council to provide incentives to landlords who offer favorable lease renewals to existing businesses. This bill, the Community Business Stability Act, will ensure our mom and pop shops are not forced out of the neighborhood by high rents. Two new projects ready for groundbreakings are the opening of a new hotel and the renovation of the George Washington Bridge Bus Terminal. The hotel, located on 168th Street between Amsterdam and Audubon, will be a great job producer in Washington Heights. And we have received a commitment from the developer and the Port Authority that prospective businesses will hire locally. Every day, Northern Manhattan is becoming a better place to start a new business. But with every new business, we must place a premium on respect for and awareness of the immediate surroundings. Our residents must be considered, particularly when a restaurant or bar opens in a residential area. We must strive to find the right balance. I encourage residents and business owners to work together to ensure concerns are addressed and businesses are supported. This will keep our community both respectful and productive for all. Making our community more attractive to businesses starts with keeping it beautiful. While Business Improvement Districts may tackle this challenge in their immediate areas, it falls on us as the residents of these neighborhoods to keep our streets, sidewalks and parks clean. Over the past 2 years, my office has held several events to educate our young people about maintaining a healthy, and clean community. My daughter and I joined them in picking up trash from our streets, getting our hands dirty, for the sake of a more beautiful environment for all. I started this initiative as a teacher at Luperon HS and today, two of our great partners in this effort are youngsters from Fresh Youth Initiatives and Centro Altagracia de Justicia y Fe. Getting kids engaged in public service teaches values of respect and community, that can last a lifetime. We will continue to make the clean streets initiative a priority in the future; holding cleaning days throughout the summer with local organizations. But ensuring our health does not stop there. When obesity rates in Northern Manhattan are higher than anywhere else in the borough, we are setting ourselves and our children up for a painful and expensive future. To stop these problems before they start, my office has worked hard to expand the number of sports programs offered to children, such as the Inwood Little League, Jaybies Sports League and the Officer Buczek Little League. And I am happy to say that through a growing partnership with the Armory, our community will have an opportunity to use a world- class track and field facility right here in Washington Heights. I must thank Dr. Sanders of the Armory and the New York Road Runners for opening their doors to our community. I can also announce that this year the Armory will be hosting a celebrity basketball game for charity sponsored by univision radio, with the proceeds to be directed to educational programs. Also at the Armory, for the second year in a row, through coordination with Senator Espaillat and Assembly Member Rosa, the Uptown Games were a huge success. Over 1,000 students from our local schools participated this year and next year we are working to get every school in the district to participate. We must also take note of our eating habits and those of our children. I encourage everyone, especially our youth, to make conscious decisions when choosing what to eat and drink. The overconsumption of unhealthy choices can lead to dangerous conditions like diabetes and heart failure. We will be looking to partner with Columbia University, CUNY, DOE, Columbia Presbyterian Hospital and our CBOs to promote healthy lifestyles and nutritional education. Additionally, through council funding, programs such as Community Visions Council are working to open more farmers markets, where residents can buy fresh and inexpensive produce. It is about the future of our community, we must sustain healthier lifestyles to ensure we live longer and maintain our quality of life as seniors. Speaking of our beloved seniors, during my time in office, I have worked hard to see that our senior centers provide the best service possible. This past year, we helped ARC Fort Washington to implement a new transportation system for homebound seniors to keep them engaged in many services available in the community. For our seniors and disabled communities, the Dyckman Street 1 train station will soon be wheelchair accessible. And I will continue to push for elevators at the 181st station and especially at the 168th station for wheelchair-bound hospital patients to have easier access to transportation. Something we are very proud of, coming soon, is the new cultural center at the Alianza Dominicana Triangle Building. This building, administered by Catholic Charities, will house the Washington Heights Community School of the Arts, People’s Theatre Project, Teatro Stage Fest, and others, bringing a central site for our wonderful cultural programming and giving local artists another forum to show their great work. The Alianza building will remain a shining example of cultural pride in our community. Along with the Betty Shabazz Malcom X Center, the Morris Jumel Mansion, the Community League of the Heights, and Gregorio Luperon, we will make 165th street a cultural place where we can attract tourism. In Marble Hill, I have been in discussions with developers of the River Plaza shopping center about an expansion of the property that should offer more jobs to our community as well as more space for local businesses to rent and increase the support to community groups. The Marble Hill community is also anxiously waiting for the co-naming of Broadway between 225th and 228th streets as Ted Corbitt Way in honor of the great Olympic long distance star, first president of New York Road Runners and former resident of the Marble Hill Houses. Next month, in honor of Juan Rodriguez, we will be holding a day of celebration with CUNY’s Dominican Studies Institute and Harlem and the Heights Historical Society, to mark the 400-year anniversary of our beautiful city of immigrants. To commemorate this great figure, we will be renaming a stretch of Broadway from 159th Street to 218th Street, Juan Rodriguez Way. I want to thank Speaker Quinn and my colleagues at the council for helping us make this a reality. With the support of the NYC Economic Development Corporation we will revive the Sherman Creek project so that our waterfront looks like that of Battery Park, with playgrounds and walkways, gardens and recreational facilities. In our beautiful parks, many damaged by Hurricane Sandy, we will re-plant hundreds of trees to protect our air quality and environment, hoping to work in partnership with the NY Restoration Project. And we remain committed to keeping our parks safe. This means more foot patrols, better enforcement and brighter lights at night so that everyone can feel comfortable enjoying the treasures of Northern Manhattan. Although I believe that One Police Plaza should make major reforms on its stop and frisk policies, I support our inspectors and the police officers they work with to keep our community safe. Last year, I stood on the stage of the George Washington campus to deliver this address, and this is very fitting, as not only has George Washington come a long way since then, but together, as a community, we have progressed as well. I truly believe that a community united can produce amazing results, and through strong community empowerment, that is what I expect to see in the coming years! and we will stand united to make our community great for our generations to come! Thank you so much for your support and God bless you all!